(وَرُدَّ) عَلَى الْقَائِلِينَ بِعَدَمِ قَبُولِ الصَّبِيِّ بِإِجْمَاعِ الْأَئِمَّةِ عَلَى قَبُولِ حَدِيثِ جَمَاعَةٍ مِنْ صِغَارِ الصَّحَابَةِ مِمَّا تَحَمَّلُوهُ فِي حَالِ الصِّغَرِ (كَالسِّبْطَيْنِ) ، وَهُمَا الْحَسَنُ وَالْحُسَيْنُ ابْنَا ابْنَتِهِ صَلَّى اللَّهُ عَلَيْهِ وَسَلَّمَ فَاطِمَةَ الزَّهْرَاءِ، وَالْعَبَادِلَةِ: ابْنِ جَعْفَرِ بْنِ أَبِي طَالِبٍ، وَابْنِ الزُّبَيْرِ، وَابْنِ عَبَّاسٍ، وَالنُّعْمَانِ بْنِ بَشِيرٍ، وَالسَّائِبِ بْنَ يَزِيدَ، وَالْمِسْوَرِ بْنِ مَخْرَمَةَ، وَأَنَسٍ وَمَسْلَمَةَ بْنِ مَخْلَدٍ، وَعُمَرَ بْنِ أَبِي سَلَمَةَ، وَيُوسُفَ بْنِ عَبْدِ اللَّهِ بْنِ سَلَامٍ، وَأَبِي الطُّفَيْلِ وَعَائِشَةَ وَنَحْوِهِمْ، رَضِيَ اللَّهُ عَنْهُمْ، مِنْ غَيْرِ فَرْقٍ بَيْنَ مَا تَحَمَّلُوهُ قَبْلَ الْبُلُوغِ وَبَعْدَهُ. And he (the author of alfiyatul-Hadeeth ألفية الحديث on whose work Imam sakhawi is writing this sharh fath ul-Mugheeth) refuted those who refused to accept the hadeeth of children (in many ways, one of which is) by listing the narrators upon whom there is an `ijma of the ummah to take from and many such sahaaba who heard from the prophet `alayhi salatu wa-salaam during their childhood /before puberty days such as Hasan, Hussain who were the children of his (beloved) daughter Fatima az-zahra. And likewise (the scholars have narrated from young sahaaba such as ) Ibn Ja`far ibn abi talib and ibn Zubair and Ibn `Abbas and Nu`man ibn Bashir , Saaib ibn Yazeed and Miswar ibn makhramah and Anas (ibn malik) and Maslamah ibn makhlad and `Umro ibn abi Salamah and Yusuf ibn `abdillah ibn salam and Abu Tufayl and `Aisha (his own wife who married him at 9 when she was mature but still very young) and the likes of them radhiallahu `anhum - without differentiating between what they heard before or after puberty. أَخْبَرَنَا أَبُو عَبْدِ اللهِ الْحَافِظُ، أخبرنا أَبُو سَهْلٍ أَحْمَدُ بْنُ مُحَمَّدِ بْنِ زِيَادٍ الْقَطَّانُ [ص:250] النَّحْوِيُّ، حدثنا مُحَمَّدُ بْنُ الْجَهْمِ السَّمَرِيُّ، أخبرنا الْهَيْثَمُ بْنُ خَالِدٍ الْمُقْرِئُ، حدثنا يَحْيَى [ص:251] بْنُ الْمُتَوَكِّلِ الْبَاهِلِيُّ، حدثنا مُحَمَّدُ بْنُ ذَكْوَانَ الْأَزْدِيُّ، حدثنا أَبُو هَارُونَ الْعَبْدِيُّ، عَنْ أَبِي سَعِيدٍ الْخُدْرِيِّ، أَنَّهُ كَانَ إِذَا رَأَى الشَّبَابَ قَالَ: " مَرْحَبًا بِوَصِيَّةِ رَسُولِ اللهِ صَلَّى اللَّهُ عَلَيْهِ وَسَلَّمَ أَوْصَانَا رَسُولُ اللهِ صَلَّى اللَّهُ عَلَيْهِ وَسَلَّمَ أَنْ نُوَسِّعَ لَكُمْ فِي الْمَجْلِسِ، وَأَنْ نُفَهِّمَكُمُ الْحَدِيثَ فَإِنَّكُمْ خُلُوفُنَا، وَأَهْلُ الْحَدِيثِ بَعْدَنَا " وَكَانَ يُقْبِلُ عَلَى الشَّابِّ فيَقُولُ لَهُ: " يَا ابْنَ أَخِي، إِذَا شَكَكْتَ فِي شَيْءٍ فَسَلْنِي حَتَّى تَسْتَيْقِنَ، فَإِنَّكَ إِنْ تَنْصَرِفْ عَلَى الْيَقِينِ أَحَبُّ إِلَيَّ مِنْ أَنْ تَنْصَرِفَ عَلَى الشَّكِّ " قَالَ الْبَيْهَقِيُّ رَحِمَهُ اللهُ وَفِي حَدِيثِ سَعِيدِ بْنِ أَبِي كَعْبٍ الْبَصْرِيِّ، عَنْ رَاشِدٍ الْحِمَّانِيِّ أَبِي مُحَمَّدٍ، عَنْ عَبْدِ الرَّحْمَنِ بْنِ أَبِي بَكْرَةَ، عَنْ أَبِيهِ، قَالَ: قَالَ رَسُولُ اللهِ صَلَّى اللَّهُ عَلَيْهِ وَسَلَّمَ: " تَعَلَّمُوا الْعِلْمَ وَعَلِّمُوهُ النَّاسَ "
"When Abu Sa`eed al-Khudri radhiAllahu Anhu (a companion of the prophet) would see young students seeking knowledge, he would say: "(O young men!) Be you blessed with the PROPHETS WORD regarding you. He asked us to make room for you in our academic gatherings and help you learn ahaadeeth for You are our successors and the people of hadeeth (Ahlul hadeeth) after us "
"We used to gather the children together (in one place) and narrate hadeeth to them." So he did not involve himself in this endeavor, but I busied myself asking [the Companions about issues]. If I heard of a hadeeth being reported by a man, I would come to him and if he was taking his midday nap I would lay down my garment and lie outside waiting for him, with the wind blowing dust in my face. The man would come out [for Dhuhr] and see me in that state, and he would exclaim, “O nephew of Allaah’s Messenger! What has brought you here? You should have sent for me and I would have come to you!” I would say, “Rather I should come to you [to seek knowledge].” I would then ask him about the hadeeth I heard. al-Shu`bi narrates -- and also Hammad ibn Salama from `Ammar ibn Abi `Ammar -- that Zayd ibn Thabit intended to go on a trip, whereupon the young `Abd Allah ibn `Abbas stood humbly at his side and taking hold of the reins of his mount adopted the attitude of a humble servant in the presence of his master. Zayd said to him: "Don't, O cousin of the Prophet." 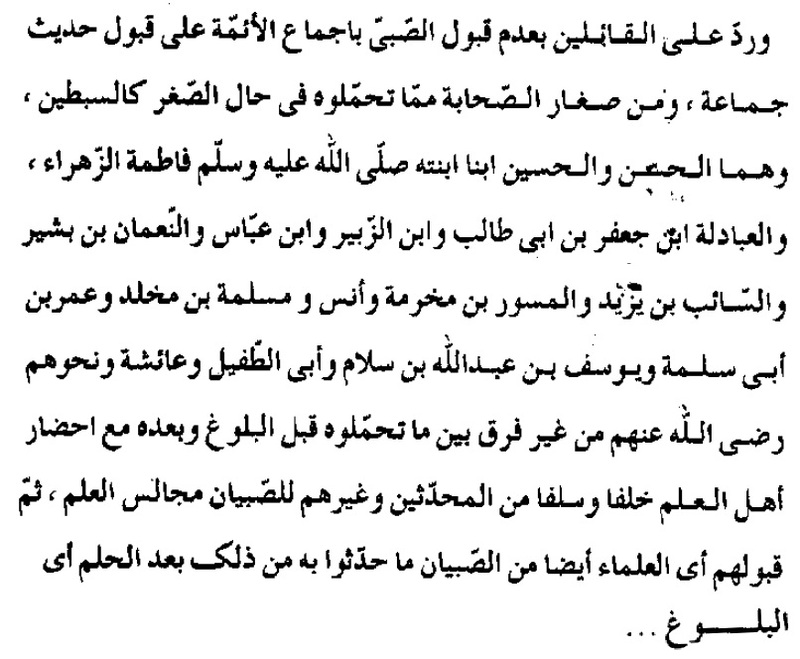 "Thus we were commanded to treat our ulama and elders," was `Abd Allah's reply. Zayd said to him in turn: "Let me see your hand." Abdullah stretched out his hand. Zayd, taking it, kissed it and said: "Thus we were commanded to treat the members of the household of the Prophet." al-Abhari and Ghazali mention it, and the latter adds that `Umar once helped Zayd Ibn Thabit to mount his camel by holding his foot, and said to the onlookers: "Do the same." al-Zabidi (Ghazali's commentator) said: "I.e. with your `ulama'." Hatim bin Isma'eel narrates from Ja'far bin Muhammd from his father that Ali bin Husain used to instruct his son to say, "I believe in Allah and disbelieve in the Taghoot." 'It is upon the parents to teach their children, the young ones, first things first; that what is obligatory to be kept away from, and what is necessary to carry out, and his belief. So the father should study with, and remind his son with the matter of Tawheed and that Allaah is the Lord of the worlds. He is the Creator of things, the One who provides for the living, and that Muhammad is His Prophet and that Islam is his religion so that the child is familiar with these matters and he instils this in his nature. When the child is able to distinguish, he is taught the Wudu and the prayer, and he is warned against Zina, stealing, lying, against eating Haraam, blood and dead animals etc. We used to make toys out of dyed wool for the children and keep them with us so if the children asked us for food we would give them the toys to distract them until they completed their fast.